We’d love your help. Let us know what’s wrong with this preview of Poetry Will Save Your Life by Jill Bialosky. For Jill Bialosky, certain poems stand out like signposts along her life’s journey. These poems From critically acclaimed New York Times bestselling author and poet Jill Bialosky comes an unconventional coming-of-age memoir organized around the forty-three remarkable poems that gave her insight, courage, compassion, and a sense of connection at pivotal moments in her life. To ask other readers questions about Poetry Will Save Your Life, please sign up. In Poetry Will Save Your Life, Jill Bialosky—a poet, novelist, memoirist, and editor for W.W. Norton—charts her life via the poems that have meant a lot to her. Each short chapter deals with a certain aspect of Bialosky's life (falling in love for the first time; her parents' divorce; her own experiences with motherhood, her working life, etc.) and includes poems that remind her of that particular time, or that helped her through that particular time. 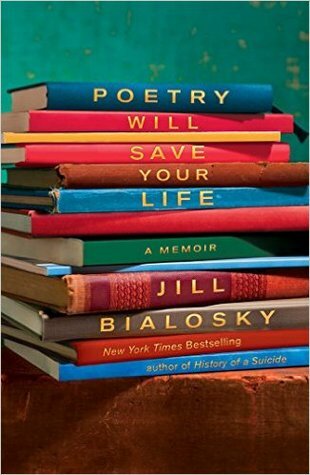 The goal seems to be to show how vital poetr In Poetry Will Save Your Life, Jill Bialosky—a poet, novelist, memoirist, and editor for W.W. Norton—charts her life via the poems that have meant a lot to her. Each short chapter deals with a certain aspect of Bialosky's life (falling in love for the first time; her parents' divorce; her own experiences with motherhood, her working life, etc.) and includes poems that remind her of that particular time, or that helped her through that particular time. The goal seems to be to show how vital poetry is, how it's not some rarefied ivory-tower genre but something that we can relate to in our day-to-day lives. As a lover of poetry, I'm totally on board with this idea. I just wish it had been better executed here. The memoir element was hit or miss for me. The sections dealing with Bialosky's childhood are simplistic and rather shallow; it isn't until she moves into the events of her adulthood that the book gains some depth and really begins to work. The chapter on 9/11, for example, and the one on her experiences with motherhood, were extremely moving and made me wish she'd gone back and applied that same level of skill and insight to the earlier chapters. Of course, the poems she chose to feature also made a difference; if you can read "Try to Praise the Mutilated World" without being moved, I'm not sure I want to know you. Nonetheless, the poetry element was also probably the weakest part of the book. Bialosky presents each of the poems she's chosen and then explicates it, but the explication is so basic it's almost insulting to the reader. She explains things that are obvious, quotes back lines that we literally just read without adding any further insight to them, and never delves any deeper, even for poems that clearly have a lot of layers. It got so I'd read a beautiful poem and immediately dread the facile interpretation that I knew was going to follow. Bialosky also sometimes does a bafflingly poor job of connecting the poems to her actual life, which is odd because... that was kind of the whole point of the book. Poetry lovers will agree that poetry can bring comfort and joy, but save your life? That dramatic title seems an exaggeration until you read about Bialosky’s life. While everyone experiences troubles and loss, she’s had enough for a whole neighborhood. I especially love memoirs by writers. Not only are they better written than your average tell-all memoir, but you get to see how a writer emerges. It’s amazing how many women authors have a Jo March moment in their youth. Write what you know! That Poetry lovers will agree that poetry can bring comfort and joy, but save your life? That dramatic title seems an exaggeration until you read about Bialosky’s life. While everyone experiences troubles and loss, she’s had enough for a whole neighborhood. but as we watch her grow into a poet and editor, we get a different perspective. We get to read the poems most meaningful to her at each stage of her life. The chapters are short: perfect for taking a breather and savoring each poem. She relates a stage or incident in her life and presents a poem or two or three that helped her through. She shares so many of my favorite poems that she also evokes my memories. I have only one criticism of the book. Too often Bialosky paraphrases the poem to be sure we understand it. Clunk! It’s not only a bit insulting of readers’ intelligence, but slows the pace. triggered the writing, or tells us what a poem means to her personally, the explication adds interest. This review has been hidden because it contains spoilers. To view it, click here. Poetry resonates with Jill through all the difficult times of her life, including the death of her father and loss of her babies. I had problems getting into her life stories for the most part. There were several interesting poems. I liked the idea behind the book: writing a memoir with famous poems to go along. Though it could ring echoes of “These Are My Favorite Things” from The Sound of Music, author Jill Bialosky is too personal and wise to waste our time or her intention. Somehow she is able to do two or three things at once here: catalog some of the most important and memorable poems ever written, recall her life stage when these works were encountered, and finally reveal their lasting significance. Though it lacks the drive and progressive revelation of her best selling memoir, The History of a S Though it could ring echoes of “These Are My Favorite Things” from The Sound of Music, author Jill Bialosky is too personal and wise to waste our time or her intention. Somehow she is able to do two or three things at once here: catalog some of the most important and memorable poems ever written, recall her life stage when these works were encountered, and finally reveal their lasting significance. Though it lacks the drive and progressive revelation of her best selling memoir, The History of a Suicide: My Sister’s Unfinished Life (2011), it does weave together personal disclosure and a fiction writer’s sense of story with a poetic attention to detail. Bialosky years as a poetry editor for Norton Publishing pay off with her sharp recall and grasp of some of the poems that have helped her and others to survive. As the book declares, “Poems offer signposts of the significant moments in a life—sexual awakening. leaving home, the loss of a parent and deaths of a child, the joys of motherhood, a sister’s suicide, a mother’s aging, the day in New York City when the Twin Towers fell.” Bialosky maintains a conversational style while opening her sharp mind and caring heart. Time and again she proves her thesis of survival through the arts. But it is not a work of an essayist but one of a person who believes in the power of art to connect us in our shared humanity. For this we must be grateful. This book likely won't astound a contemporary poetry reader with its analysis or its selections, yet it does so much to communicate poetry as a vital force to a general audience. A book about poetry not aimed at grad students and poets-in-progress is really admirable and well-executed here, and I enjoyed reading it. poetry's sole purpose is the subjugation of the poet's identity via commercial forces. Publication is self-murder. A rather grandiose title, eh? I have mixed feelings about this one. I thought the concept was interesting — part poetry, part memoir. It’s a great way to introduce someone who doesn’t normally read poetry to some of the most famous and moving poems in English. But most people who like poetry already know these poems (e.g. "The Road Not Taken," "Richard Cory," "We Real Cool," "The Snow Man"), often by heart. There’s nothing wrong with putting them in front of us again. But I’d have to agree with t A rather grandiose title, eh? There were enough mistakes, misquotes, typos, and grammatical oddities to make me rather cranky (“off of,” crèmes in the bathroom, rather than creams — maybe a little crème fraîche?). I often didn’t agree with Bialosky’s interpretations of the poems, though what they mean to her is obviously okay. I was also irritated by Bialosky’s writing about events of long ago in the present tense. Yes, I know that present tense lends a sense of immediacy. It’s fine in some fiction. But this is a book in which the author is constantly moving back and forth between the present and the past. So it’s annoying to find the past discussed in the present tense. And it made for some pretty awkward sentences. After suffering tragedy in her life, Jill Bialosky uses her favorite poets and poetry to get her through the struggles. loved this mix of important poems in the context of works that find you at just the right time in life. Part memoir, part poetry, part analysis. This book is perfect for anyone who doesn't really like or understand poetry, but wants to give it a second chance. Poetry categorized into a life. A wonderful mix of story-telling, highlighted by the greatest poets of our lives. I thoroughly loved this concept! Jill Bialosky draws the epigraph for her ninth book, "Poetry Will Save Your Life: A Memoir," from the poem "Dedication" by Czeslaw Milosz, which asks: "What is poetry which does not save / Nations or people?" As her superlative title suggests, Bialosky organizes this memoir around 52 poems by such poets as W.H. Auden, Gwendolyn Brooks, Emily Dickinson and many more that she believes answer Milosz's question admirably, in that they are "both personal and communal" and "remain a sustaining source of comfort." She uses these poems to make sense of crucial moments, from the death of her father when she was 2 to decades later when she's living in Manhattan during the September 11 attacks. Subsequently, this is a delightfully hybrid book: part anthology, part critical study, part autobiography. For years, Bialosky explains, "I've flagged poems in individual volumes or anthologies with paper clips and Post-its. I have Xeroxed poems and stuck them on my refrigerator." Once in a while you pick up a book that is a surprising gem. For me, this was one of those books. Bialosky, an esteemed poet, has collected poems that identified certain pivotal moments in her life. "Being a poet sometimes puts you at the mercy of life, and life is not always merciful," she says (p. 112). In this book, she presents a famous poem, shares the poet's message, and tells what resonated with her. Some of Bialos ky's stories are very powerful, and many really resonated with me. In her Once in a while you pick up a book that is a surprising gem. For me, this was one of those books. Bialosky, an esteemed poet, has collected poems that identified certain pivotal moments in her life. "Being a poet sometimes puts you at the mercy of life, and life is not always merciful," she says (p. 112). In this book, she presents a famous poem, shares the poet's message, and tells what resonated with her. Some of Bialos ky's stories are very powerful, and many really resonated with me. In her chapter on motherhood, she writes, "Perhaps we turn to poetry because it can fathom and hold the inexplicable, the gasp between words, the emotional hues impossible to capture in everyday speech or conversation" (p.180). This book reminds us of what it is like to fall in love with Poetry. The author talks about falling in love with poetry, while in fourth grade reading The Road Not Taken by Robert Frost, the poem that first started my love for poetry as well. She talks about the parallels in her life and the poem. She goes on to talk about Gwendolyn Brooks poem We Real Cool seared through her memories. She goes on to talk about Star, the poem by Jane and Ann Taylor the nursery rhyme is based on takes her back to loosing their Minitature black poodle that sadly was never found. She goes on to talk about reading poems from A Child's Garden of Verses. She talks about how Robert Louis Stevenson's Poem The Shadow spoke to her, as well as The Swing! I Wandered As Lonely as Cloud by Williams Woodworth reminds her of the son reflecting off her Son's hair. Langston Hughes Poem Shame reminds her of how blessed she was and I Too reminds her of that as well. And she goes on to tell ofHow Psalm 23 speaks to her of the spirit of her ancestors! She talks of My Child Blossoms Sadly by Yehuda Amichai, the poet had immigrated to Palestine with His Orthodox Jewish Family while Germany was under Hitler's evil reign. She talks about Have You Prayed, reminds her of praying for her loved one's. Wallace Steven's The Snowman reminds her of winters in Cleveland Ohio. Stopping by the Woods On a Snowy Evening by Robert Frost took her back to the memories of sitting in front of a black and white television set as a Girl of six, learning of JFK's assasination! She talks about how Ars Poetica reminds her to push beyond boundaries. 1 January 1965, by Joseph Brodsky reminds her f feeling awkward around the adults and not understanding the passion about being Jewish. Childhood by Rainer Marie Milke reminds her of the importance of appreciating Childhood. Those Winter Sundays by Robert Hayden reminds her of when she is in fifth grade and her Mother announces that she is married, but husband and wife do not always get along, and often her Mother is left alone while her stepfather spends all night out. Emily Dickinson's Poetry speaks often of the feeling of adolescent girls. My Papa's Waltz reminds her of the Hope they found after her Mothers Fourth pregnancy, hope for a new beginning, but it also reminds her of the longer periods of time her stepfather is away! Sylvia Plath Poppies In October reminds her of her Mother slipping into depression. Sympathy Paul Laurence Dunbar reminds her of the 1970's The Vietnam War. Bright Star by John Keats and A Blessing by James Wright reminds her of first love. Taking The Hands by Robert Bly and Somewhere I Have Never Travelled, Gladly Beyond by E.E Cummings Speaks of Friendship! Songs of the Last Act by Louise Bogan speaks of love and Marriage. The author goes on to talk about her youngest sister taking her life at the age of 21, by then she is thirty one married, an editor and poet, pregnant with her first child and she's blindsided by this loss. Musse Des Beaux Arts by W. H Auden and One Art by Elizabeth Bishop speak to her in this time. Tulips by Sylvia Plath and Walking in the Blue by Robert Lowell speak of Suicide and remind her of the pain of loosing her sister. In this book we are reminded that poetry speaks to us in life, if we just take the time to reflect on it. I give Poetry Will Save Your Life five out of five stars! Jill Bialosky, author of books such as History of a Suicide: My Sister’s Unfinished Life, The Life Room and House Under Snow here takes memoir using poetry to share episodes of her life. The beauty lives in moments that feed upon poetry. Or does poetry feed upon the moments? It’s a unique approach to sharing one’s memories, some tragic, others humiliating, but all about loving, questioning, trying to find meaning. Just why do we turn to poetry? How can a few lines encompass an entire state of being, of feeling? Poetry is often an island we find ourselves on after the shipwrecks in our lives, and there are many. It can be a friend whose shoulder you cry on, a curious companion hungry for revelation wondering at the marvels of being alive, as much as the voice of grief or first love. I am much reminded of an English teacher that taped quotes and poetry lines all over his classroom. This induced a feeling of euphoria for me, particularly in that moment in time when I was ‘coming of age’ myself, and the world could seem both beautiful and terrifyingly brutal. Those words made me feel less alone, whether they had the bite of sarcasm or a spirited push towards courage. Bialosky takes poetry that was meaningful to her. With Musée Des Beaux Arts by W.H. Auden, she finds a bridge that expresses the dreadful grip of tragedy, the weight of grief in her own life. Yet, poetry is a solitary endeavor, we peck at it and eat what gives us sustenance. Much like any art form, we experience poetry differently from the next person. Poetry can be the cry of the lonely, a plead for the guilty, a roar for the proud… it is fluid and each person has a different perspective than the next. This memoir is an outpouring of an emotional journey and yet it is fluid itself. If you love exploring poetry with a kaleidoscope of one’s life and how much poetry meant to them, this is perfect for you. I particularly think these are some of the best lines written about suicide. “I don’t understand it or know what to do with it. I’m angry. Not at my sister, but at all I don’t understand of the human psyche and the forces that unwillingly impinge upon a life. I don’t know what to do with this knot of fury.” What comes first, the poem or the experience? If you are remembering a poem after something pivotal has happened in your life, was the poem something like a premonition, portending the future? Or are we simply fishing for meaning in order to organize the mess all of our lives are, to find a semblance of order ? Why do certain images or words brand themselves in our mind returning only after such a moment has passed? Who has the authority to say? Poetry for Bialosky has been a companion, as it is for so many of us. An English professor at the University of Pittsburgh irked me once when he didn't care for the way I ended a poem about the decay and eventual death of a relationship. I thought the piece was pretty darn fabulous because of all that twenty-something angst he objected to in my closing line. Professor Oakes urged a revision, telling me: "Paula, poetry is about survival." All these years later, reading Jill Bialosky's "Poetry Will Save Your Life," I have to admit, Professor Oakes was right. In her b An English professor at the University of Pittsburgh irked me once when he didn't care for the way I ended a poem about the decay and eventual death of a relationship. I thought the piece was pretty darn fabulous because of all that twenty-something angst he objected to in my closing line. Professor Oakes urged a revision, telling me: "Paula, poetry is about survival." All these years later, reading Jill Bialosky's "Poetry Will Save Your Life," I have to admit, Professor Oakes was right. In her beautifully written and unique memoir, Bialosky tackles important themes and relationships that touch every life: family, depression, envy, shame, death, passion, imagination, terror, discovery, marriage, faith, danger and wonder, to name only a few. As her coming-of-age narrative unfolds, she matches each of these themes with the poems that guided her and gave her hope as she grew into adulthood. Bialosky shares work by Louise Gluck, Sylvia Plath, Wallace Stevens, Robert Bly, Elizabeth Bishop, Czeslaw Milosz, W. S. Merwin, and many others, that helped her to make sense of her life transitions and tragedies, and, ultimately--as my wise professor pointed out all those years ago--find a way to survive. Very enjoyable and informative. Easy to read in short spurts...the "memoir told through poems" format lends itself to a simple formula: personal anecdote, poem, synopsis/personal relation. While I'm not familiar with Bialsosky's work herself, her use of other poets to tell parts of her own story mean occasional introductions to other poets I've yet to read. Sad at times and (obviously) reflective very often, the only fault I can find with this book (which almost feels like I'm unfairly nitpickin Very enjoyable and informative. Easy to read in short spurts...the "memoir told through poems" format lends itself to a simple formula: personal anecdote, poem, synopsis/personal relation. While I'm not familiar with Bialsosky's work herself, her use of other poets to tell parts of her own story mean occasional introductions to other poets I've yet to read. True, this book suffers from comparison, and I’ve just come off reading a lot of other (better) poetry texts. It skews more closely to memoir than poetry, but it does include a lot of good examples and classics in the text. The problem is that these poems are framed by short memoir pieces and some cursory analysis that is at times clumsy or at worst (depending on your judgement) plagiarized. The review in The Tourniquet Review explicates these passages more clearly, so I A disappointment, at best. The problem is that these poems are framed by short memoir pieces and some cursory analysis that is at times clumsy or at worst (depending on your judgement) plagiarized. The review in The Tourniquet Review explicates these passages more clearly, so I won’t revisit them here, but even if that didn’t bother me, I found some really sloppy copywriting in the text, such as at the link below. This really took me by surprise in a book by someone with so many credentials. There are some really beautiful parts, but I could not recommend this book even in part. I have never read a memoir until now, and let me say, I loved it! Poetry has always been a sore genre to me. I didn't really understand it and I thought that all poems had to rhyme. Because of this, I have protested to not write poetry. Although, this book has changed my view on poetry. I've realized that poetry doesn't have to make sense. Unlike stories, poetry captures a single moment in time. They tell of feelings and quick thoughts, not long narratives and complicated plots. So, yes, I really I have never read a memoir until now, and let me say, I loved it! So, yes, I really really really enjoyed this memoir because it was so personal. It connected to poetry in a beautiful way and you could really tell that she is passionate about what she does. Jill Bialosky gives us a highly readable and well-written memoir which ties the stages of her life to the poems that were important to her then and remain important to her to this day. I love this concept!! This book reminded me of how valuable poetry is as an artform, and makes me determined to bring it back into my life again. Well done, Ms. Bialosky, well done!! Many thanks to NetGalley and Atria Books for allowing me to read an e-ARC of this book in exchange for an honest review. Have always wanted to read more poetry but have trouble understanding most of it. This author breaks down some famous works that helped her at different stages of her life and writes about the poets and how their own life experiences probably prompted their writings. She also explains the way poetry is constructed and how it should be read to get the most meaning out of what is written. Will be looking for more reads like this and hopefully more poetry. Jill Bialosky was born in Cleveland, Ohio. She studied for her undergraduate degree at Ohio University and received a Master of Arts degree from the Writing Seminars at The Johns Hopkins University and a Master of Fine Arts degree from University of Iowa Writer's Workshop. Her collections of poems are Subterranean (Alfred A. Knopf, 2001) and The End of Desire (1997). Bialosky is also the author of Jill Bialosky was born in Cleveland, Ohio. She studied for her undergraduate degree at Ohio University and received a Master of Arts degree from the Writing Seminars at The Johns Hopkins University and a Master of Fine Arts degree from University of Iowa Writer's Workshop. Her collections of poems are Subterranean (Alfred A. Knopf, 2001) and The End of Desire (1997). Bialosky is also the author of the novel House Under Snow (2002) and The Life Room (2007) and co-editor, with Helen Schulman, of the anthology Wanting A Child (1998). Her poems and essays appear in The New Yorker, O Magazine, Paris Review, The Nation, The New Republic, Kenyon Review, American Poetry Review among other publications.